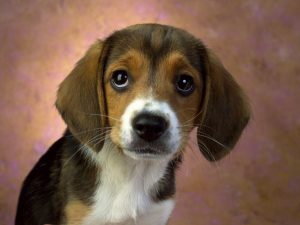 Originally bred as a scent hound, the Beagle is a small to medium sized dog which is mainly kept today as a companion. 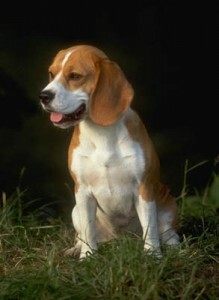 Similar to the Foxhound in appearance, it has a small, sturdy frame, sleek tri-colour coat, rounded, soft ears and an appealing, earnest expression. A friendly, non-aggressive dog, robust and easy to care for, the Beagle is a sweet-natured canine companion which makes an ideal family pet. An active breed given to boredom, the Beagle can become destructive if not exercised regularly. A naturally curious dog, he is inclined to wander away when off the lead. He also has a propensity for rolling in anything unmentionable that he finds en route, meaning a lead is usually better than letting him run loose. 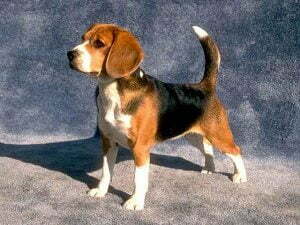 The Beagle has a short, dense coat which is tri-coloured black, white and tan. The eyes are coloured hazel or brown. The Beagle has a short, fine coat that requires minimal grooming – a quick brush each day being all that is needed to remove loose hair. However, Beagles have the habit of rolling in whatever muck they can find, in order to disguise their scent while “hunting”, so regular baths are a must. When grooming, you should pay attention to the ears, which being long and pendulous are prone to infection. The nails also grow quickly, so may need regular clipping if the dog isn’t exercised on hard ground. Beagles enjoy hunting in long grass, so keep an eye out for fleas and ticks as well. The Beagle is generally a healthy, robust dog, with few health problems. Epilepsy, heart disease and back problems are the most common ailments, though these can be controlled with medication. Some puppies suffer from dwarfism and “Funny Puppy” disease (characterised by slow development, weak legs and susceptibility to illness), but this is rare if you buy from a reputable breeder. Eye infections are common in older dogs, but easily treatable. Obesity can be a problem especially in older, more sedentary animals. The diet must be carefully regulated as Beagles will eat anything they can find. Some Beagles perform an alarming action called “reverse sneezing”; a way of drawing in air which can temporarily make the dog sound like it’s choking. It isn’t known why Beagles do this, but it’s harmless and you should not worry. The Beagle is an amiable, good natured dog who enjoys both human and canine company. Originally bred to run in a pack, he can suffer from separation anxiety and should not be left alone for long periods. Beagles are excitable by nature, and get bored easily. Plenty of toys help to dissuade destructive behaviour indoors. Beagles have a piercing bay or bark, and “give voice” readily, which can be annoying to both dog owners and their neighbours. Although it is not an aggressive breed, children should be taught not to overexcite the dog. The Beagle is an intelligent breed that is widely used as a sniffer dog. However, its reputation as a pack animal has given it a single-mindedness which can make it hard to train. It’s best to start as early as possible, using a system of reward training. Although generally obedient, the Beagle is easily distracted and can be hard to recall, so tends to spend more time on the lead than other breeds. It’s essential you have a secure garden, as Beagles are known to vault quite high fences in search of their latest quarry. Although only a small dog, the Beagle has almost boundless energy, with a high demand for exercise. Ideally, he should be given a good walk twice a day. Less likely to chase a ball than to go off into the wide blue yonder, the Beagle is the ideal breed for those who enjoy country rambles. An old English breed, there have been Beagle-type dogs in Great Britain since the 12th century. Edward III was known to have hunted with a pack of 120 of them during the 100 Years War. The name may be derived from the old French word “begueule,” meaning “open throat” – a reference to its characteristic bay. During the Renaissance period, Beagles were used to hunt hares and wild rabbits in Wales and France, while in Scandinavia they were even used to hunt wild boar and deer. However, during the reign of Henry VIII it became fashionable to breed toy Beagles just 8 to 9 inches tall. These so-called “Pocket Beagles” were a great favourite with Queen Elizabeth I, who kept a pack of them. Although this breed is thought to be extinct, dwarf pups do turn up in modern litters from time to time, which some say is a throw-back to the Tudor dogs. In the 1830s the Reverend Phillip Honeywood developed a Beagle for hunting that is believed to be the forerunner of the dogs we see today. 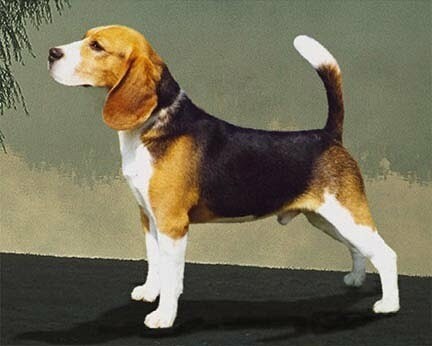 These were smaller than today’s Beagles, and pure white, but from then onwards a standard began to develop. In the 19th century several Beagle strains were apparent, among them the medium, dwarf, fox and rough-haired Beagle (which survived well into the 20th century.) However, a Beagle Club was established in 1890, at which time a definitive standard was laid down. Although it’s a popular pet, the Beagle is first and foremost a working dog. There are several hare coursing Beagle packs in the UK (with the hunting being done on foot), and Beagles are also used as drug sniffer dogs, in both the UK and the US. Perhaps the most controversial use of Beagles is in animal testing laboratories, where their placid nature and small size make them a popular choice. However, this is in decline. 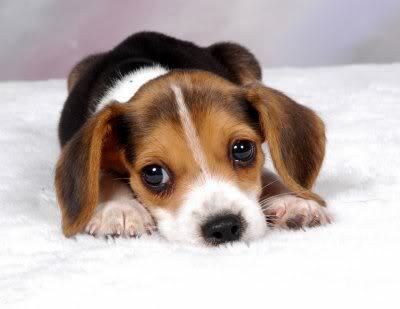 In 2005 Beagles accounted for less than 0.3% of all animal experiments performed in the UK. Beagles feature heavily in popular culture. The best known fictional Beagle is Snoopy, from the cartoon “Peanuts.” Other famous Beagles include Odie, Garfield’s long suffering sidekick and Gromit, the brains behind all of Wallace’s inventions in Wallace and Gromit.